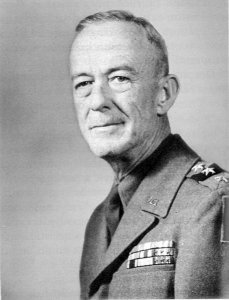 The Pacific War Online Encyclopedia: Hodges, Courtney H.
Hodges commanded large Army units in the Mediterranean and European theaters throughout most of the Second World War, culminating with the command of 1 Army in northwestern Europe. Following the defeat of Germany, 1 Army was scheduled for redeployment to the Pacific to participate in the invasion of Honshu. The invasion never took place, since the Japanese surrendered following the first nuclear attacks.